According to Nielsen‘s quarterly Global AdView Pulse report, Television remained the dominant media type in terms of advertising investment in the first quarter of 2013 with a 59 percent share of media spend share and 3.5 percent growth globally. It appears that TV will maintain this position at least for the short term, however, TV advertising was not immune to the economic problems in Europe in Q1, leading to a 2.9 percent decrease in this region. Display Internet advertising, though measured in a smaller subset of countries, grew a significant 26.3 percent for the first quarter. Display internet ad growth was particularly impressive in the Asia-Pacific (33.2%) and Latin America (48.2%). Internet even bucked the trend in Europe, boasting growth of 10.4 percent. Following Display Internet, Outdoor experienced the largest percent increase in ad spending – up 4.3 percent to a 3.3 percent media spend share. Decreases in print advertising continued slowly, as both spending in magazines and newspapers both declined in the first quarter (-2.8% and -4.7%, respectively). Newspaper ad spend decreased in North America, Europe and Asia-Pacific, while magazine ad spending decreased in Europe, Asia-Pacific, Latin America and Middle East & Africa, showing that print advertising is declining around the globe. The two media types combined, however, still hold nearly a 30 percent media share, validating that print is still a power player in the media mix for marketers. Randall Beard, global head, Advertiser Solutions for Nielsen said “We see trends continuing in media, with less-steep ad spend increases in TV and very slight declines in print, making way for growth in the digital space. Although these changes in traditional media are slight, it’s worth noting how the placement of ad dollars is shifting over time”. 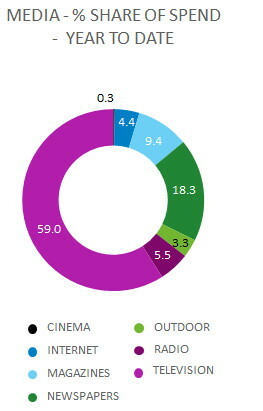 Cinema experienced a 5.8 percent decrease, holding a 0.3 percent media spend share. This entry was posted on Thursday, July 25th, 2013 at 13:21 @598 and is filed under DailyDOOH Update. You can follow any responses to this entry through the RSS 2.0 feed. You can leave a response, or trackback from your own site.